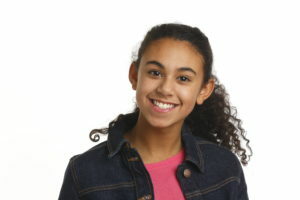 Meet 2019 Children’s Rehabilitation Foundation Youth Ambassador, Alyssa! When 13-year-old Alyssa White enters a room, she grabs everyone’s attention with her amazing smile and huge energy! Saying she has a positive attitude is an understatement. At birth Alyssa was diagnosed with spina bifida. Alyssa first visited the Rehabilitation Centre for Children (RCC) when she was 3-months-old. Since that initial visit, therapists and technicians at the Rehabilitation Centre for Children’s Prosthetics & Orthotics department and spina bifida clinic have helped her reach her full potential. 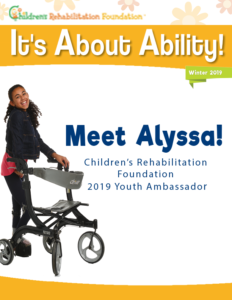 As the 2019 Youth Ambassador for Children’s Rehabilitation Foundation, Alyssa will spend the year representing the children and youth who benefit from the equipment, programs and services provided by the foundation and the RCC. “It is a privilege to be chosen as the 2019 youth ambassador, I am so excited! I would tell others with disabilities that it doesn’t matter if you have a disability, you can do anything if you dream it or believe you can do it!” said Alyssa.